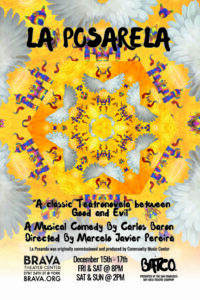 The San Francisco Bay Area Theatre Company (BATCO) presents La Posarela by Carlos Baron, directed by Marcelo Javier Pereira. La Posarela is the heartwarming “teatronovela” of José y María (Joseph and Mary) who, after leaving their home behind to find a safe life for their baby Jesús, must obey the absurd immigration orders of a mad Emperor. This musical comedy tells the story of how these two immigrants overcome their difficult journey battling racism, xenophobia, gentrification, misogyny and fear. Originally commissioned and produced by the Community Music Center, this revamped tradition is great for all ages, especially for some of you veteranas y veteranos.